Rashtriya Sanskrit Vidyapeetha, a University established under section 3 of the UGC Act, 1956 is a premier instituion in the field of higher learning in Sanskrit studies, Trditional Sastras and Pedagogy. It is funded by the Ministry of Human Resource Development through University Grants Commission, New Delhi. 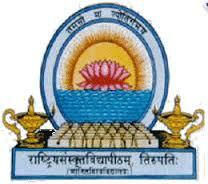 The Vidyapeetha has a long history in the service of Sanskrit education. The vidyapeetha was established at Tirupati (A.P.) in 1961 by the Govt. of India on the recommendations of the Sanskrit Commission (1957) as an autonomous body under the name of Kendriya Sanskrit Vidyapeetha Tirupati Society. Dr. S.Radhakrishnan, the then Vice Presiden t of India laid the foundation stone of the vidyapeetha on 4th January 1962. The basic objective of setting up the Vidyapeetha is to impart and improve Sanskrit pedagogy, to accelerate the pace of higher Sanskrit learning and to combine the traditional Sanskrit education with modern scientific research. Later, Kendriya Sanskrit Vidyapeetha, Tirupati came under the administrative control of Rashtriya Sanskrit Sansthan as an autonomous body under the Ministry of Education in April 1971. In the year 1987 the Vidyapeetha was declared as a Deemed University by the Government of India, considering its service to the cause of Sanskrit Education, achievements in research and pubications and general progress in the past 25 years. it was formally inaugurated by teh President of India Sri. R.Venkataraman on 26th August, 1989. considering its achievements and potential for reseach in Traditional Sastras, the Univesity was given the status of Center of Excellence in Traditional Sastras during the X plan period.